Biolea Greek Extra Virgin Olive Oil - Biolea, an artisanal Greek olive oil is from a specific "terroir" untainted in its quality & taste, reflecting the uniqueness of Biolea. Boilea is produced using only the Koroneiki olive. Biolea Greek olive oil is from the Astrikas Estate olive groves, located within the PDO (Protected Denomination of Origin) in Northern Crete. Biolea Greek olive oil is exclusively estate-produced & bottled. 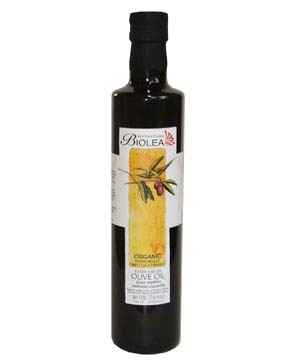 Biolea is an extraordinarily flavorful oil, featured & recommended by Food & Wine Magazine as one of its Top Five "Must Have" Specialty Foods of 2007. Biolea extra virgin olive oil...Organic production, using traditional methods, creates entirely natural olives with concentrated flavor of unsurpassed quality. Each bottle of Biolea Greek olive oil is certified organic. Use Biolea to flavor dishes prepared without heat. Pair this oil with one of our delicious vinegars to make a salad, or pour it with lemon juice over freshly steamed vegetables to make a delicious, healthy accompaniment to any meal. Or simply savor the delicate character of this oil with a fresh baked loaf of rustic bread. Biolea Organic Greek Extra Virgin Olive Oil. 17.5 oz. (500ml) bottle, with pop-up spout.